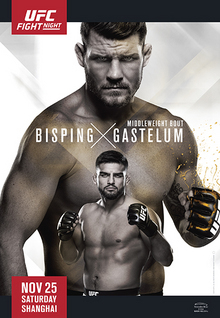 The poster for UFC Fight Night: Bisping vs. Gastelum. UFC Fight Night: Bisping vs. Gastelum (also known as UFC Fight Night 122) was a mixed martial arts event produced by the Ultimate Fighting Championship and held on November 25, 2017, at Mercedes Benz Arena in Shanghai, China. After previously contesting three events in Macau (a Special administrative region of China) since 2012, the event marked the first that the promotion held on Mainland China. A middleweight bout between former UFC Middleweight Champion Anderson Silva and The Ultimate Fighter: Team Jones vs. Team Sonnen middleweight winner Kelvin Gastelum was expected to serve as the main event. The pairing was previously scheduled to meet in June 2017 at UFC 212. However, Gastelum was pulled from the bout after he tested positive for Carboxy-Tetrahydrocannabinol (Carboxy-THC) which is a metabolite of marijuana or hashish above the 180 ng/mL allowance by the World Anti-Doping Agency (WADA) standard. In turn, despite having two months to secure an opponent, Silva and promotion officials confirmed on May 11 that he would not compete at that event. On November 10, it was announced that Silva had failed an out of competition drug test stemming from a sample collected on October 26 and as a result had been pulled from the card. A day later, former middleweight champion and The Ultimate Fighter 3 light heavyweight winner Michael Bisping was secured as a replacement opponent for Gastelum. Bisping had fought 21 days prior to this event at UFC 217, where he lost the championship to former two-time UFC Welterweight Champion Georges St-Pierre. On November 18, it was announced that James Mulheron had failed an out-of-competition drug test stemming from sampled collected on November 10 and as a result he was pulled from the card. His scheduled opponent, Cyril Asker, remained on the card and faced promotional newcomer Yaozong Hu. A pair of promotional newcomers, Liu Pingyuan and Bharat Khandare were expected to face each other at the event. However, Pingyuan pulled out in November and was replaced by fellow newcomer Yadong Song. At the weigh ins, Rolando Dy weighed in at 148 pounds, 2 pounds over the featherweight upper limit of 146 pounds. As such, the bout was held at a catchweight and Dy forfeited 20% of his purse to Wuliji Buren. On January 30, 2018, it was announced that Mulheron accepted a one-year suspension due to his failed test. He originally tested positive for clomiphene and hydroxyclomiphene. On February 1, a report came out revealing that Silva tested positive for methyltestosterone and an unspecified diuretic. On July 18, Silva was suspended for one-year, retroactive to November 10, 2017, after USADA traced his second positive drug test to a compounding pharmacy known for producing tainted supplements. ^ Staff (2017-11-25). "UFC Fight Night 122 draws announced 15,128 fans for sell-out in mainland China debut". mmajunkie.com. Retrieved 2017-11-25. ^ a b Dann Stupp (2017-07-30). "UFC makes mainland China debut with Shanghai event on Nov. 25". mmajunkie.com. Retrieved 2017-07-30. ^ Dave Doyle (2017-08-10). "Anderson Silva vs. Kelvin Gastelum agreed upon for UFC Shanghai". mmafighting.com. Retrieved 2017-08-10. ^ Damon Martin (2017-04-06). "Kelvin Gastelum pulled from fight with Anderson Silva after testing positive for marijuana". foxsports.com. Retrieved 2017-08-10. ^ Staff (2017-05-11). "Yup, it's official: No Anderson Silva at UFC 212". mmajunkie.com. Retrieved 2017-08-10. ^ Marc Raimondi (2017-11-10). "Anderson Silva fails USADA drug test, out of UFC Shanghai main event". mmafighting.com. Retrieved 2017-11-10. ^ Ariel Helwani (2017-11-11). "Michael Bisping vs. Kelvin Gastelum targeted as new UFC Shanghai main event". mmafighting.com. Retrieved 2017-11-11. ^ Todd Martin (2017-11-04). "UFC 217 live updates: St-Pierre wins middleweight title by submitting Bisping". latimes.com. Retrieved 2017-11-11. ^ Staff (2017-11-11). "James Mulheron pulled from UFC-Shanghai opener due to potential USADA violation". mmajunkie.com. Retrieved 2017-11-18. ^ Staff (2017-11-19). "Indian MMA: Bharat Khandare reportedly gets an opponent change for UFC Shanghai". thefangarage.com. Retrieved 2017-11-22. ^ Staff (2017-11-23). "UFC-Shanghai official weigh-in results: Gastelum needs towel, but headliner set". mmajunkie.com. Retrieved 2017-11-24. ^ "UFC Fight Night: Bisping vs. Gastelum". Ultimate Fighting Championship. Retrieved 2017-08-17. ^ Staff (2017-11-25). "UFC Fight Night 122 bonuses: Gastelum, Jingliang among $50,000 winners in China". mmajunkie.com. Retrieved 2017-11-25. ^ Alexander K. Lee (2018-01-30). "James Mulheron accepts one-year suspension for USADA violation". mmafighting.com. Retrieved 2018-01-30. ^ Steven Marrocco (2018-02-01). "Report: Anderson Silva positive for synthetic testosterone, diuretic in recent failure". mmajunkie.com. Retrieved 2018-02-01. ^ Steven Marrocco (2018-07-18). "USADA suspends Anderson Silva one year after tainted supplement found". mmajunkie.com. Retrieved 2018-07-18. This page was last edited on 8 March 2019, at 09:16 (UTC).